HVAC stands for heating, ventilation, and air conditioning. HVAC contractors install, service, and maintain HVAC systems. This type of work is generally considered a type of specialty contracting. The construction industry is one of the most heavily regulated in the United States and this is no less the case for contractors working in specialized fields. Each state has unique contractor licensing laws, specialty classifications, and specialty contractor application requirements. In some states HVAC contractors must obtain a specific HVAC license. In Kentucky, a HVAC Contractor License is required for all individuals and businesses performing HVAC services. The application requires passport photos of each applicant, examination score certificate, proof of general liability insurance, and proof of employment. The application fee is $375 and the license must be renewed annually. In other states, HVAC contractors must obtain the general contractor license. In North Dakota, all contractors who perform more than $2,000 worth or work must be licensed. The application requires information on all officers and owners, a statement from North Dakota Workforce Safety & Insurance that the applicant has secured satisfactory Workers Compensation coverage and proof of general liability insurance. Applications fees range based on the monetary amount of each project the contractor plans to work on and the license must be renewed annually. 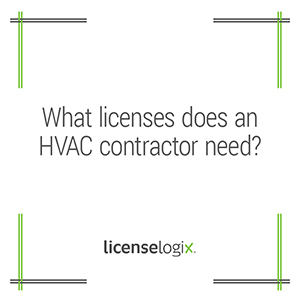 If the HVAC contractor will be doing residential work, they may need to obtain a state or local home improvement contractor license. Pennsylvania does not have a general contractor or an HVAC specific license, but any HVAC contractors who perform services in residential homes must register with the Office of the Attorney General as a home improvement contractor. HVAC contractors may also need to obtain state business entity registration with the secretary of state, sales tax registration, corporate income tax registration and payroll tax registration. State and local basic business licenses may also apply. LicenseLogix will help you obtain any HVAC licenses and registrations for your business, minimizing time-consuming and costly delays. If you are already licensed, we can manage license renewals and ongoing license compliance. For additional help you can fill in the form on the right or give us a call at (800) 292-0909.